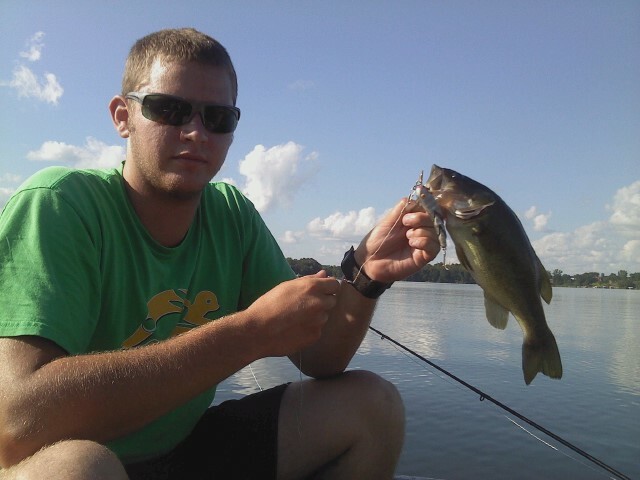 Old, but still catching fish! No, not me...but old lures!! 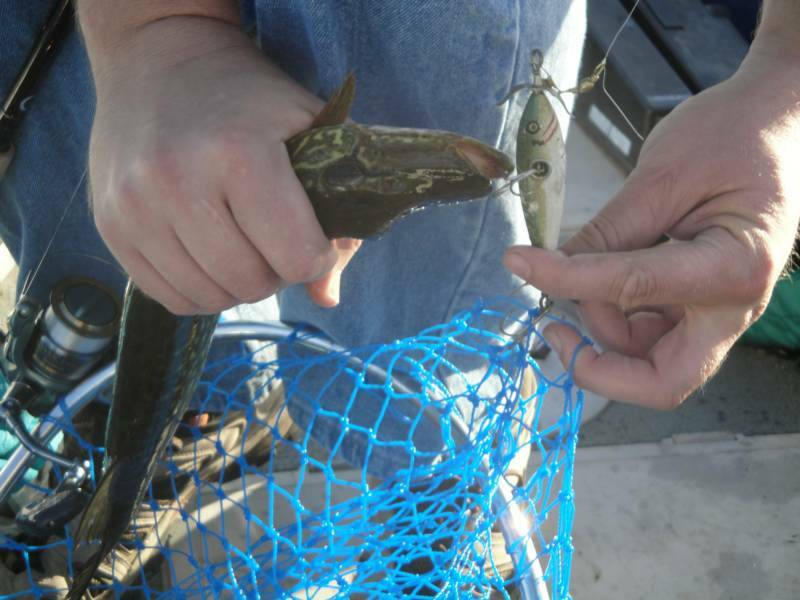 Many lure collectors have never fished with an old lure, let alone caught a fish on one. I have tried out many lures in my collection and can tell you how the action is in the water and if they still catch fish. 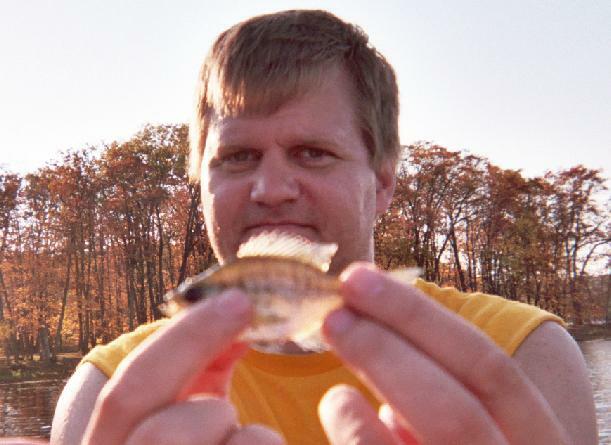 In 2009/2010, I set out to take pictures of fish I caught on old lures. 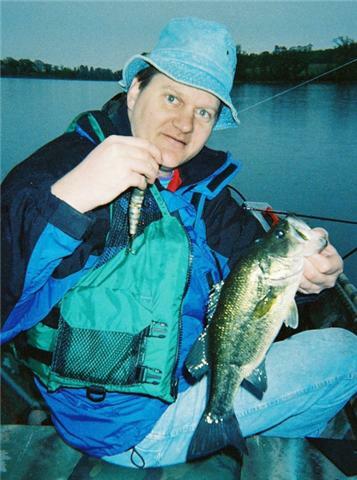 If you have a fish caught on an old lure or better yet…old tackle (pole, line, lure, wood boat used), send me a picture and let me know if I can add one picture to my website! The Bite ‘Em Bate is a surface lure that has a wooden cone shape that revolves above a hook assembly that stays in place when reeled in. Evidently, the turbulence and the color changes created from the lure body revolving do attract bass. Quite a neat design, and it was enough to fool this large 6.5 pound bass. The Baby Crab Wiggler dives slightly under the water with plenty of action. 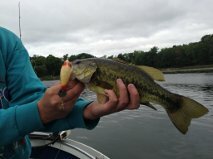 This little bass could not resist this round-wood-block-of-a-lure, even though it was be a mouth full for him. The Pikie Minnow was first introduced around 1919, and was a very popular lure for bass, pike, crazy panfish and I even caught a bullhead on one once! I never fished with these lures until I found so many in tackle boxes at auction sales that I decided to give them a try. Now I use them all the time for they work great. I especially like the jointed style which offers a little more action. My wife keeps a few in her tackle box too. The Heddon River Runt is one of my favorite lures to fish with. If fact, it is the lure that got me into lure collecting. I still have a tackle box full of these lures in many shapes and colors. The plastic River Runts were made from 1933 and into the 1980s. This color (note the gold eyes) was only available until about 1961. 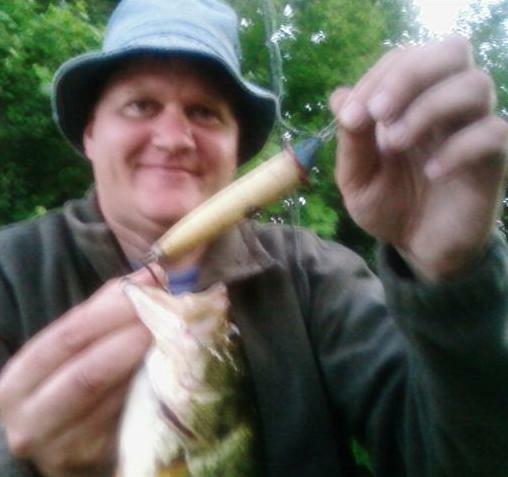 This lure is the large version of the Rush Tango…and even at over 4 inches long, this 4 pound bass engulfed it! I actually had to take the lure half out, or you wouldn’t even see it in his mouth. This floating wood lure dives to about 4 feet deep when reeled in, and found this nice bass hiding from the hot July weather. This was the first commercially made lure by Heddon, and was made from about 1902 to about 1910. I dated the style pictured to about 1907. 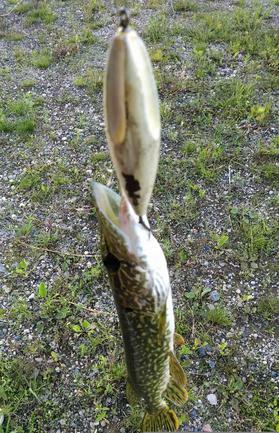 This lure has caught a lot of fish, which is obvious due to its condition. But how would you look after over 100 years of work? While casting from a dock, this fish still found this lure irresistible. I don’t fish often with this lure, but there is nothing like catching a fish on a 100 year old lure. 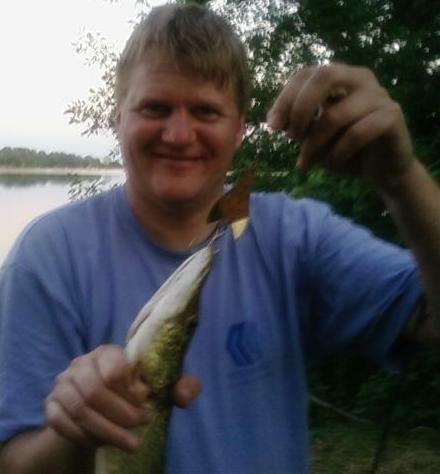 Even though this picture is not the best nor is the fish very big, it may be time to finally retire this lure. The Goite is a metal spoon similar to the arrowhead spoons from the late 1880s. The spinning flash of these lures still catch fish. Hmmm, this is what I seem to catch when I try to fish with lures made after 1990…. This wood triple-jointed lure has great action in the water. Not only that, it is heavy so you can cast it a long distance. A freind and co-warker (Marc) from Manila was in the US and I took him out fishing. I gave him the easy to cast Gamefisher, and he caught several fish on it! This small northern cound not resist this underwater minnow with hand-painted gill marks. This 100-year-old lure fooled this bass in very heavy cover. River Runt does the stunt, or so their slogan said. This little lure proves it can still haul in the big ones! 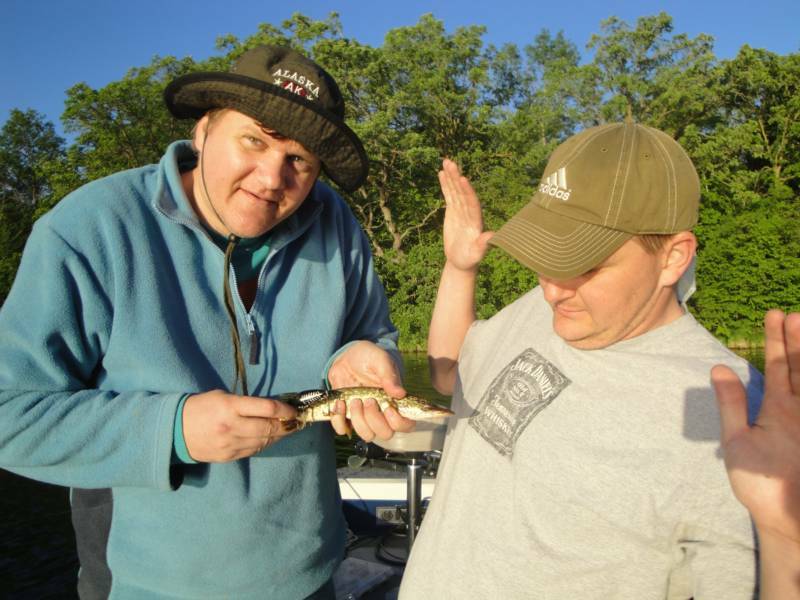 Why, even my brother "Runt" is amazed at the Runt lure. My nephew, who seemed to be out-fishing me the year these pictures were taken, shows that he can catch fish on old lures too. He is using a double-jointed Gen-Shaw Bait that is nearly older than his and this uncle's age put together. The Bass-Oreno is one of the all time best fishing lures, in my opinion, and it has been around since 1916. This small lure was named after one of the seven dwarfs. Even though small, it is heavy and costs far. And, even though it is made of wood, it sinks like a rock. 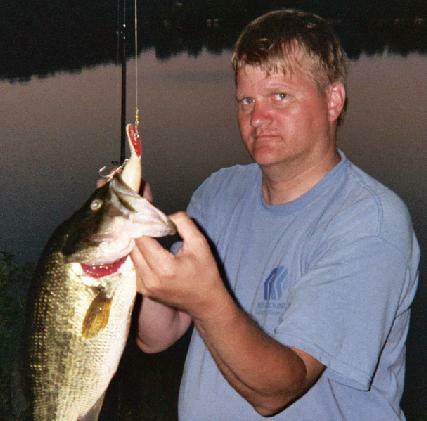 But, the action is great and it sure catches the small northerns right off the dock. The first time I say this lure in action, I gave one to my dad to use...and he looked at this odd lure with a smilely face painted on it and said "Yea, right". Then, he caught a 3 pound bass on it. Then I gave a yellow one to my niece to try, and she called it a "school bus" lure. She didn't have any luck. So, I tried it off the dock, and this northern was the first fish I caught on it. Strange lure, but it has a very strong wobble action. We just had our Nissila Family Reunion, so I have to try a lure with a "Finlander" name. This hammer handle nailed the lure, and tore his mouth in the process. But, I do like to eat northerns...so he will head to the frying pan. For those of you that don't know how to filet a northern and won't eat them, you don't know what you are missing. And, northerns are tough. Even with this tore mouth, he will survive if released. 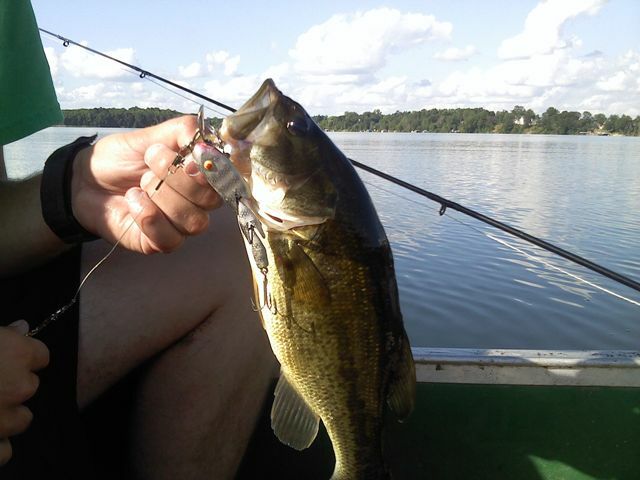 This jointed plastic lure lives up to its name today as it fooled this nice bass. These lures, or other L & S lures, are found quite often in old tackle boxes. It is no secret, I still fish with this lure type more than any other. Why? They work great, of course. I do fish with old lures, but many I use until I catch one fish...then they are put away. But, the River Runt is used again and again. Am I afraid of losing an old lure? Yea, sometimes I am. But, that is part of the thrill, right? On this particular day...after already catching several fish, a large northern tore my line and I lost this River Runt. This lure is still easy to find even if they are not made anymore, but I was still bummed. But, later that night, I was kayaking...and found my lure near the place I lost it! The pike was able to shake it...and this lure went back into my tackle box where it belongs! 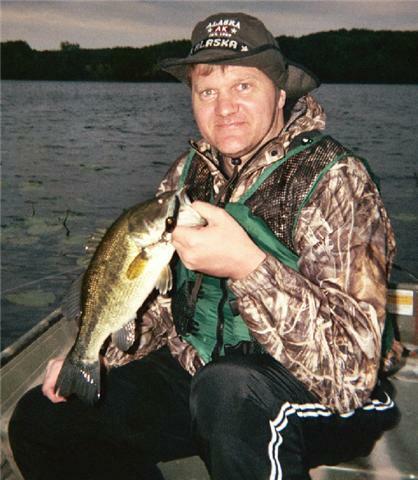 This lure was made in Osakis, MN...not far from where this bass was caught. Although the lure was made locally, I doubt the fish in this area have ever seen this lure in the water...at least one may not have been cast in the last 30 or 40 years or so...unless some old-timer out there still uses them. The first time I used this "beat-up" Zig Wag, I caught 3 bass in the first 10 casts with it. I couldn't believe it. Since then it has not left my tackle box, and I finally decided to take a picture of a fish with it. 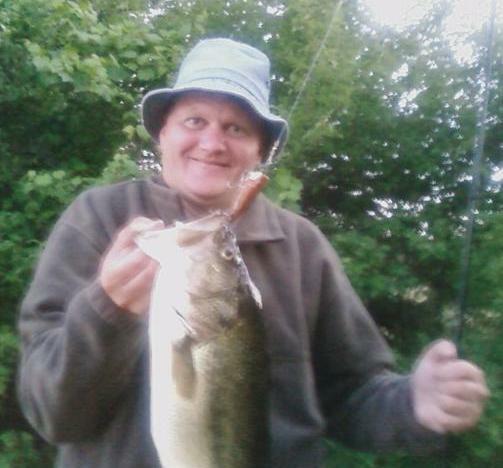 I don't know if it is the large open mouth, the wiggle of the lure from the joint, or the bright red head with real glass eyes...but this lure really catches the fish. Shakespeare came out with a winner when they introduced their swimming mouse in 1924. I have fished with one for years...and I know my dad used to own a black and white one. This wood lure can be cast a mile and it wiggles just barely under the service of the water. Bass can't seem to resist it in early Spring! This lure was featured as a "Lure Of The Month" on my website. To learn more about this lure, click HERE. 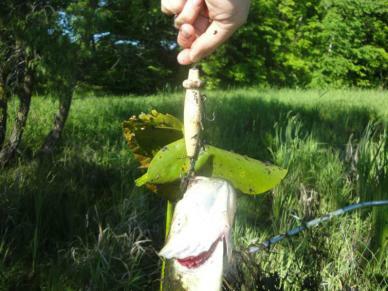 99 years after this lure was first introduced...this red and white lure finds this small bass. Don't get this confused with the "Wig Wag" pictured a few fish earlier. That lure came later and from a different company. It was a totally different design. This surface lure runs on the top of the water like a "drill bit". It found this bass in the shallows on a nice calm morning. This picture was taken by Tom Carlson in Minnesota. "Checked out my collection downstairs and the old Paul Bunyan spoon shouted at me. Couple casts later on the Crow River and this little guy just had to check out the antique." 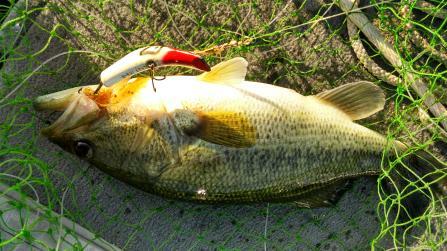 On a cool, fall day, this bass struck this lure as soon as it touched the water on a cast. This lure swims "backwards" with a great action. They have a great wiggling action and they do catch fish! This old lure has an erratic action just under the surface, thanks to the wooden grooves carved in this lure. 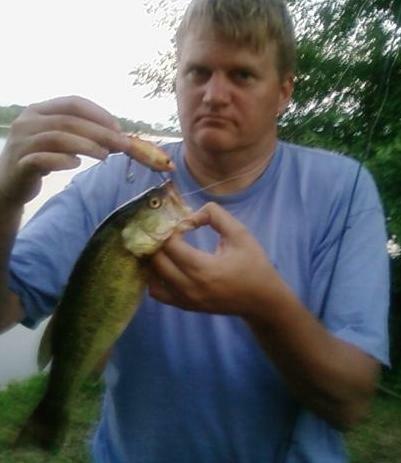 This small "hammer handle" couldn't resist this bait that imitated an easy meal.